Most consumers would agree that great music should stand on its own without the aide of drugs to create wonderful listening experience. 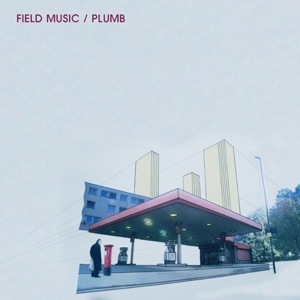 However, hearing Plumb, the fourth album from English brother duo Field Music, some may waiver to let their guard down on such a generalization. Plumb is a fifteen-song, thirty-five minute rock opera; a score that may be best heard while high. Not because the music is bad–it’s actually quite impressive–but because the music might have been created with the intention for such a medium of listening. As compared to Field Music‘s third album Measure, which was a straightforward rock compilation, Plumb has songs ending with bubbles fading out (“A New Town”) and tracks beginning with grandfather clock chimes (“A Prelude to Pilgrim Street”) and a forty-second a capella interlude (“How Many More Times?”). It’s so utterly reminiscent of the Beatles on Revolver or Pink Floyd, that making the claim of Plumb being enjoyable while high seems obvious. Siblings Peter and David Brewis shift between the fragments of their songs in such dramatic ways that it’s Broadway-esque. Like most rock musicals, the brothers have journeyed to the ends of auditory rock history from naught looping to ’70s disco flair. But instead of matching varied music to vastly different characters, they’ve used the disjointed sub genres to build Plumb. Their refrained movements are quickly eclipsed by principal choral voices or intense drum smashes, making it easy to picture the staging of this fantasy musical. Had someone said this album was released in 1968, you’d have no problem believing it. But since the debut is this week, we’ll just have to settle for Plumb being the Brewis brothers’ ode to one of the most special times in music. Flower children, Field Music‘s Plumb is the album you’ve been waiting a very, very long time to hear from a contemporary band.